We use different well-known tricks to motivate students so that they can achieve their academic goals smoothly. We assist students for their IB Maths HL/SL, their internal assessments, extended essays, and also in their theory of knowledge. IB elite Tutor is a place where you get all your required IB help under one roof. All our IB tutors are highly qualified, trained, experienced and dedicated professionals who feel pride in helping their students. They maximize their potential by developing a passion for learning in them. Majority of our tutors are working in top-most IB world schools. Here are a few salient features of our service. Our IB Maths Home Tutors in Gurgaon are well-versed with latest technological advancements. They know how to use the latest technology to help their students. We believe that a thousand words can’t explain what a visual can. We use a lot of videos, images, powerpoint presentations to explain the difficult concepts. Our tutors share a lot of PDF files with different exam-style questions to help the students. Our IB Maths Home Tutors in Gurgaon use advance java applets to explain complicated Mathematics graphs and diagrams. We arrange special sessions to explain the use of GDC. This helps a lot in improving student’s performance in paper two. There are many online resources available for free that can extend support for better learning in Mathematics. IB Maths Home Tutors in Gurgaon believe in an old academic proverb, “The Better You Revise, The Better You Perform in Your Exams”. Usually, a student started studying a particular topic finishes it and write exams for these topics/chapters after five or six or sometimes after eight months of it. Nobody can expect to remember eight months old theory and solve questions based on it. So its really important to revise things many times before and during the exam times. And to revise you must complete your syllabus as early as possible. Here, Our tutors can help you a lot. They can make a schedule for you to finish the syllabus early. And also to revise things quickly and in the best possible way. Our IB Maths Home Tutors in Gurgaon buy memberships of places like Revision Village, IB-Stuff, Think IB, IB Resources etc so that they can get the latest IB content and help their students. Besides this, our dedicated content development team is busy throughout the year in developing useful and compelling IB content for our students. Because good content is like a guarantee of success in IB Maths HL/SL. We only hire tutors who are experienced and properly qualified and are capable to deal with IB Maths curriculum. Our tutors are ten to fifteen years experienced professional who is always ready to help their students. A big number of them is working with topmost IB schools throughout the world. They understand the requirement of each and every student and they also know how to fulfill it. Though we have a very strong team of IB Maths Home Tutors in Gurgaon and we have the capacity of providing home tutors to all students. Yet we offer the blended form of tutoring too. There are a lot of parents in the city who wants to hire home tutors for their sons or daughters. In this case, we provide them with online IB tutors who are living in nearby locations like in Delhi or Gurgaon. Students can take online tuition and they can also request their tutors to visit their place when their parents are at home. Thus they can enjoy the blended form of IB tutoring. Generally, we see that students are taking IB tuition from one tutor throughout the year but they look for other tutors to help them for their Maths internal assessment. This is because their tutors are not capable to handle their Maths IA. But this is not the case with our IB Maths home tutors in Gurgaon. They train their students for their internal assessment throughout the year in a systematic manner such that students are capable to handle their IA at their own under the guidance of their tutors. 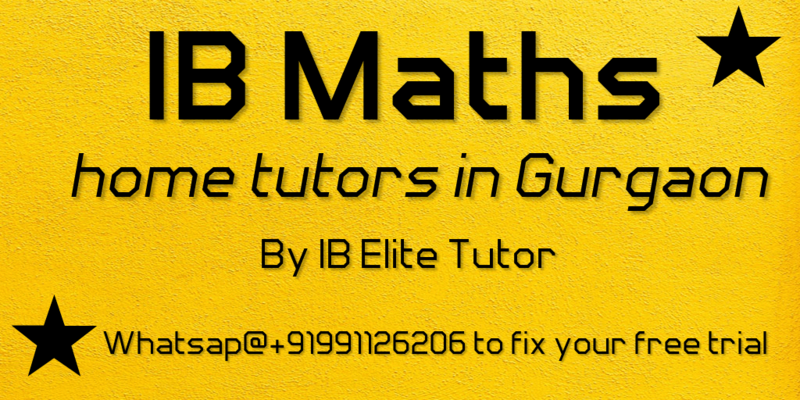 IB Elite Tutors offers the most affordable IB tutoring in Gurgaon. You get a one-hour free trial session for free to get the taste of service. If you like it, you can continue with it. And yet you only pay us the tuition fee. We don’t charge you anything for the notes, papers or videos that we provide you during the sessions.